What is art to you? Is it simply having your preschooler glue pre-cut out the eyes, mouth and nose on a face? Or is it allowing your child to design a face the way they envision? Children should be given the opportunity to express themselves through art, thus allowing children to make the face as they see it and enjoy the process of creating art. The term “Process Art” was coined by the artist Robert Morris in 1968, when he first began experimenting with soft felt to celebrate the way it was impacted by both gravity and stress. Sometimes called Anti-Form or Post-Minimalist art, Morris’ early works were achieved by a simple process of cut and drop — hence the unevenly arranged pile of pink felt scraps littering the floor at the Guggenheim Museum in New York. The importance of Process Art is that it simply refuses to conform to anything. The finished product is actually unimportant. What matters is the process used to create it. Allowing children to express themselves through Process Art is beneficial for more reasons than just the finished product. It encourages and promotes children to have good decision making skills. Do I want a happy face or a straight face, etc. It also gives the child a real sense of pride and ownership. 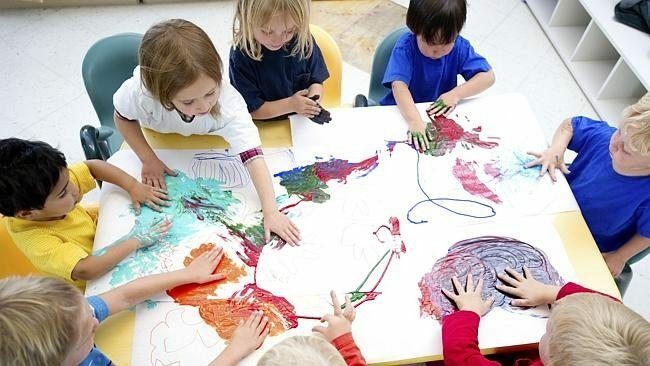 Process Art brings out artistic creativity within the child, not to mention it helps develop fine motor skills by using scissors, squeezing glue bottles, etc. It also boosts creative confidence, rather than feeling like theirs is not like the teachers or the child next to them. Additionally, it is Sensory stimulating; squishing playdough, feeling the paint on fingers. Here are some of the ways that we try to provide open-ended, creative art experiences here at Columbia Children’s Center. When children are given expressive freedom, they are happy and proud to share their creations. The next time your child brings home their creation, ask them to tell you about it, I am sure you will be amazed by the pride and story that goes along with the description. Goodbye Summertime Snacks… Hello Brain Food!